Films created via point and shoot digital cameras, webcams, and even cell phone cameras plus computer editing suites were the media of choice showcased at the 2009 edition of The Disposable Film Festival. The results screened at the festival’s Competitive Shorts Program showed promise at best. It didn’t herald the arrival of the 21st century equivalent of the Lumieres. The Competitive Shorts Program consisted of 26 shorts boasting running times ranging from a mere six seconds to over nine and a half minutes. The styles and genres tapped ranged from abstractions to mini-narratives to documentary to even poetry video. The artistic challenge was discovering whether the creators of these narratives could rise above mere novelty. Donna Kuhn’s webcam short “Spinning” inventively manipulated and animated its various images to see what could be attempted with video editing technology. The results left at least one viewer interested in seeing Kuhn’s next effort. In two other shorts, attaching digital cameras to spinning car wheels and filming the results may seem to be the essence of novelty. Yet Rebekah Estey’s “Not In Kansas Anymore” combined self-awareness of its “The Wizard Of Oz” reference with its gasp-inducing visuals to suggest both the excitement and terror of travelling to a new place. On the other hand, Reid Bingham and Colin Challender’s “Biking Driving Throwing” used this filming technique as one of several wonderfully dizzying exercises in collapsing the distance between viewer and filmed experience. Not every short in the program was as clever as the killer backpack of Nuno Filipe’s “Mala Suerte.” Several shorts seemed unaware of the banality of their ideas. Pawel Piskorski and Michal Srodek’s “Rise Of The Machines” did nothing new with its household appliance revolt plot. “Public/Cite”’s criticism of giant ads destroying the public visual commons would have benefitted from a far more poetic touch than what Richie Gelles manages. Leslie Kennah’s plane as aerial shark short “Whitetip” proved the worst of the lot. This overlong piece spectacularly failed to transform the monotony of its plane window view beyond an inept channeling of “Koyaanisqatsi.” Instead of awe, it generated unintended laughter from the audience at one screening. The brochure for the Competitive Shorts Program touted the increasing affordability of disposable filmmaking. Compared to the usual cost and technology required to make films, that assertion was certainly true. On the other hand, if one’s financial situation resembled those of the struggling characters in “The Pope’s Toilet” and “Wendy and Lucy,” disposable filmmaking still seemed as inaccessible as Hollywood filmmaking. The San Francisco Film Society’s first SFFS Screen offering for the new year is a painful fable about people living on the economic edge. 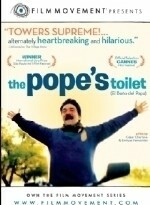 Enrique Fernandez and Cesar Charlone’s award-winning Uruguayan film “The Pope’s Toilet” deals with the villagers of Melo’s attempt to transform Pope John Paul II’s upcoming visit into economic salvation. The film depicts poverty as a casually toxic element in Melo’s environment. Despite being set in 1988, there are no streetlights in Melo. Batteries might as well be Rolex watches. Selling food and offering a pay toilet to Catholic pilgrims thus seems simultaneously plausible and desperate. As the countdown to the Pope’s appearance takes place, the film’s intimate portraits of the villagers’ hopeful activities are balanced by a clinical depiction of seeming mass hysteria. Central character Beto and his family capture in microcosm the socially deleterious effects of poverty. Beto’s big ideas continually fail to seriously improve his life. Carmen, Beto’s wife, has resigned herself to making the best of a bad life. Silvia, Beto’s daughter, rightfully sees sewing or smuggling as economic dead ends. Yet her TV journalism ambitions supply absent dignity instead of a realistic career choice. Charlone’s cinematography makes the occasionally attractive views of the Uruguayan countryside emotionally wrenching. Those beautiful rolling hills and verdant forests sharply contrast with the painful struggles of Melo’s inhabitants. Fans of Beyond Chron Religion Editor Tommi Avicolli-Mecca will wish “The Pope’s Toilet” offered an artistic decapitation strike against Catholicism. But to its credit, the film unsentimentally shows that the only miracles awaiting the people of Melo will never involve the Pope. Kelly Reichardt’s film “Wendy and Lucy” offers a far bleaker picture of economic desperation than “The Pope’s Toilet.” Michelle Williams’ titular Wendy lacks even a network of family and friends to cushion the hardship of boa constrictor economics. Her only companion, the titular golden retriever Lucy, soon disappears from the streets of Portland. Wendy’s quest to find Lucy and continue her journey to possible work in Alaska provides the film’s slight dramatic spine. “Wendy and Lucy”’s dramatic forbear is less “Marley and Me” and more film noir. The people and institutions Wendy encounters are indifferent at best and actively hostile at worst. Wendy’s waiting for news of the missing Lucy is the closest she comes to resisting her destined downward spiral. Her ties to her dog are strong enough to delay her journey to Alaska for the moment. But Reichardt resists the easy out of providing Wendy with a miraculous if low-paying job. In a way, Wendy’s refrain of “just passing through” acts as her unstated acknowledgment that no real help is forthcoming from other human beings. Michelle Williams’ simultaneously intimate and distant performance strikes the right dramatic note for her character. What may seem a thinly sketched background actually reflects the emotional realities of Wendy’s life. Her near-constant guardedness shields her from the pain of a near-constant string of disappointments. Her relationship with Lucy allows her the only respite from her hard existence. Wendy’s story is ultimately a portrait of a woman quietly struggling to keep her life from shrinking into moments of temporary safety. “Wendy And Lucy” ultimately quietly condemns the “indifferent” forces of capitalism that leaves the Wendys and Lucys of the world economically treading water.